Parasites! What are they, where do they come from and why do they make people feel squeamish? A parasite is a micro or macro-organism that needs to satisfy its vital nutritional requirements by feeding off certain host tissues or body fluids that contain the specific biochemicals that it needs. 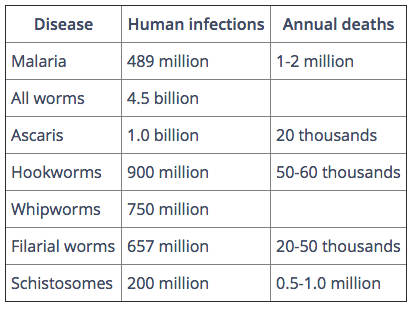 There are parasites for every single tissue of the human body  a frightening thought. In fact, some parasites can live inside us and cause no harm whereas others have more serious health consequences, and can even lead to death. Some parasites are now thought to actually benefit certain medical conditions. A common misconception is that people in developed countries are free of parasites. This is simply not true and although statistics in Europe are somewhat lacking, about 50 million American children are infected with worm parasites; only a small portion of which is detected and reported. This is particularly worrisome when one recognises that microscopic, single-celled protozoans make up about 90% of all parasitic infections in the USA*. If existing parasitic infections were evenly distributed, there would be more than enough parasites for every living person to have one! To give you some idea of their prevalence, see the table below for parasitic prevalence and associated deaths. Although travelling to certain parts of the world can increase the likelihood of picking up a parasite, you do not have to be a foreign traveller to be infected. Did you know you could obtain a parasite from simply walking on soil or sand, drinking water, having a pet or through human contact? Most parasites in humans are cosmopolitan and they do not discriminate about their hosts  anyone can catch one! The helminths are worm-like parasites and are broken down into three groups. The clinically relevant groups are separated according to their general external shape and the host organ they inhabit. Adult flukes are leaf-shaped flatworms. Prominent oral and ventral suckers help maintain position in situ. Flukes are hermaphroditic except for blood flukes, which are bisexual. The life cycle includes a snail intermediate host. The first step to helping a client in their journey back to full health is appropriate scientific, reliable testing. We recommend Parasite Testing Europe. The tests enable people to have their stool tested through the most well-researched, consistent laboratory in the world led by world-renowned parasitologist, Dr Omar Amin. Once its been established if there is an infection and the strain of parasites, its time to treat the client. However a vita next step is to ensure the clients vitality and immune system is as robust as possible. Trying to eradicate a parasite with a depleted immune system and poor health becomes an uphill battle. Secondly, a sensible approach must be taken with the right choice of eradication method. Lastly, understanding how your patient got the parasite in the first place will help to prevent reinfection. Want to learn more about parasites from a world-leading expert?